When I first met Tim Brennan from Tym Guitars in 2002, he was known for his custom made Mosrite guitars, which he called Wosrites. His retail store consisted of a little room under his house, where he also repaired guitars and made a few pedals here and there. Now it’s 2012, Tym Guitars has a beautiful retail store in Fortitude Valley and his pedals are now world famous. But the biggest thing that’s changed is that Tim doesn’t have time anymore to make many custom guitars. Which makes this guitar a rare site indeed. I fell in love with the Mosrite in the early 1990s after discovering the MC5 and Tumbleweed. However, being usually flat broke, and worse for a guitar player – left handed – I never had a chance of owning one. Enter Tim Brennan!! 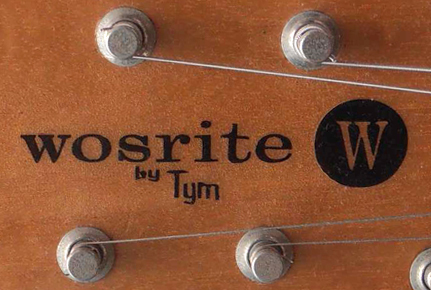 I eventually stumbled across a very embryonic Tym Guitars website in around 2000, and he very kindly set to work on a left handed Wosrite Versatone for me. As for the exact specs, they elude me now. Maybe Tim can enlighten us?! I can say that this model (#T0019) is obviously a very early one. This one has humbuckers. Soon after this was made, Tym offered p-90s/single coils. However, at the time, these were the pick ups he used, and they are super hot. This machine kills fascists, and anyone else (un)lucky enough to be infront of the speaker when your wailing on it! 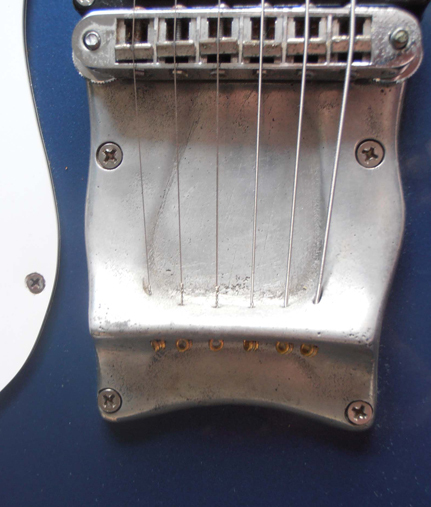 At this stage in their evolution, Tym Wosrites typically had tune o matic stop tail bridges, but Tim offered this foundry-sourced hard tail piece specifically for me instead. You can see the evolution of what would turn into the Moseley-style trem. 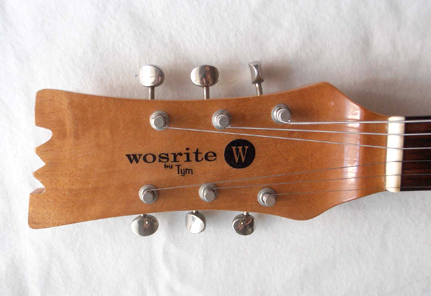 Technically, I believe this was the very first lefty Wosrite Tim made. I say technically, because about halfway through the creation of this guitar, Tim got the call from The Hellacopters with a request for a lefty Johnny Ramone model for Nicke Andersson. This had to be ready for their appearance at that years Big Day Out. So, this one was put on the backburner (naturally, as Nicke was playing the BDO and was good, and I was playing western Sydney boozers, and was not) and Nicke’s lefty was completed. I paid AU $1000 for this in around 2000 and unfortunately, due to unforseen and dire circumstances, this guitar is now up for sale. Its the most expensive thing that I own that realistically I can live without. I will consider any serious offers for this very early (and amazing) Tym Wosrite Versatone. I can be contacted at samgalloway@westnet.com.au for any further info on this embryonic Tym masterpiece. If I’m gonna sell this, it wont go for anything less than what I paid for it, at least. i wish it were a righty! i’d buy it for sure. I just wish tim would start building again. Holy crapolla ………… Man, I remember carving that tailpiece from auto “bog” and get the foundary to cast it for me so I could make it look more authentic. #0019 hey ……….. my serial number book says it was finished 04/2000 and Nicke Royales first one was #0017 in 01/2000 in time for BDO. That brings back some memories. 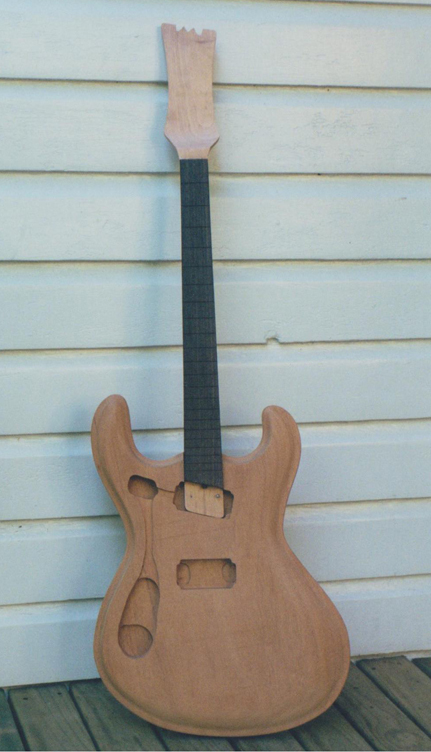 This one is a Honduran mahogany body with Qld maple neck. 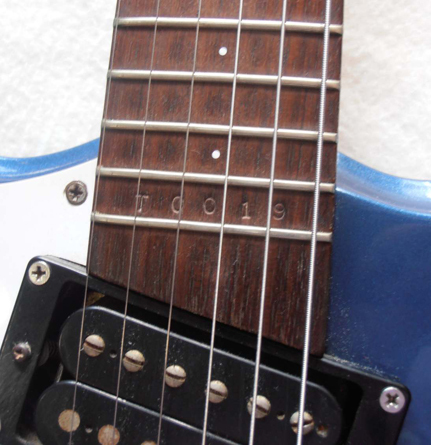 I “think” the humbuckers were high output Gotoh’s ? I made one for Brad Shepherd 4 months later using the same paint but with a matching headstock and ash body.